Hell hath no fury like Elle scorned. Ffiona is also slightly furious. Webb: Stage 4 brought us a four stage road race: Hell Hath No Fury. The first stage lulls you in with easy pack-riding. The next two stages batter you with breakaways, chase groups and climbs all in an effort to take the leaders jersey. And when you are sapped of everything, the final stage puts you and your teammates in a team time trial to secure the top podium spot. Good luck. Elle: I was really just trying to keep up with the ladies on this one. And don't let the cute, blond hair fool you, they're fast. Oh god, my legs hurt! My extreme body soreness from the Bootcamp class I did last night really enhanced the suffering for this stage. Then I have Webb giving me time-stamp updates letting me know how many minutes of suffering were left. This info was not appreciated. But some good news: I finally got my heart rate belt working (aka got a new battery). So there's that. 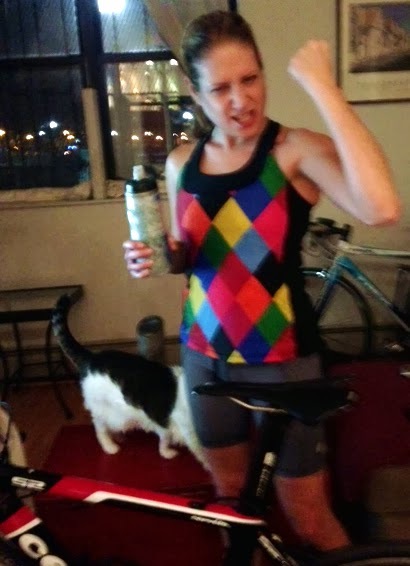 And feline Ffiona showed her solidarity to the female cause by staying next to me (in the laundry basket) for the whole workout. Strength in numbers! Webb: Yeah, I'm pretty tired. That whole not working out thing from November through December dug me a nice little hole. A hole filled with all kinds of treats like cake and Klondike bars. I love HHNF. I'm partial to longer efforts. In fact, I think HHNF is my favorite, that is until I do AVDP. I took this workout at 75% as I continue to use THE Tour as a training camp to find my legs again. Afterward, I was definitely tired, but not smashed. You know what that means? Time to wring it out with Extra Shot + The Wretched! Up Next: Stage 5: Extra Shot followed by The Wretched. Take that Couchlandrians!